Does Rihanna Wants to Have Kids? Is she Considering Motherhood? Rihanna's Opinion On Becoming a Mother: Is She Getting Married To Boyfriend Hassan Jameel? Rihanna is one of the biggest stars in the music industry. With over nine Grammy awards win including her 2018 win, she is a very hard working woman with her business venturing into different directions. As of now, she is the most trending for her Fenty Beauty cosmetics which is slowly taking over the world for the variety it provides suited for women of different color. Moreover, on 20th Feb 2018, Rihanna has touched her golden 30’s and people have started to wonder if she is going to settle down and have any kids. This has become a topic of discussion, and many rumors have also surfaced regarding the issues. Here, we are going to find out more about her desire for children and her getting married to her current beau Hassan Jameel. Continue reading to find out more. 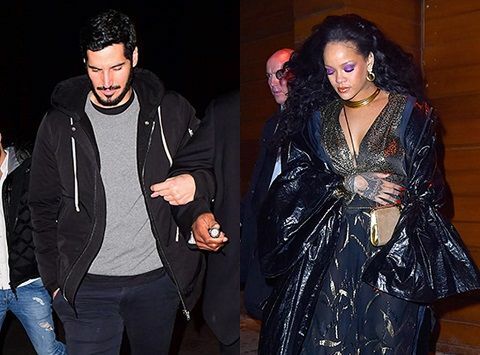 Is Rihanna Getting Married To Her Beau Hassan Jameel? Why Is Chris Brown Panicking About It? Rihanna has been in a relationship with her Saudi billionaire boyfriend Hassan Jameel for more than a year now. And unlike her other relationships, this one has not made many headlines until now. As of 2018, the power couple is making headlines as rumors have it that they are planning to get married and settle down for good. As reported by Hollywood Life, a close insider revealed that even though Jameel has not proposed her yet, their relationship is heading in the right direction in so many ways and marriage might be next. According to other sources, she is even considering moving to Paris to be closer to her bae. How adorable is that? In the past, Rihanna has been in quite a few not so healthy relationships including with Chris Brown who physically abused her and her on and off relationship with rapper Drake; this one is very different. Her new beau is not only drop-dead handsome but also a very kind hearted as reported by sources. The two are happy with each other, and they admire each other a lot. Hopefully this time it works out for the Umbrella singer, and her beau puts a ring on soon. However, not everyone is happy about it. According to sources, her ex Chris Brown is still madly in love with her and thinks about her all the time. So, he is not happy about hearing the news. Hollywood Life was even shared a statement by an insider. If you are a big fan of Rihanna, you already know that she loves kids and has been the perfect angel among them. So, what are her opinions on having a child? Well, she has been quite vocal about having children from very long. Back in 2012, when she appeared in The Ellen Show, hosted by Ellen DeGeneres herself, she was asked if Riri wanted children and she replied that she would undoubtedly want kids and would love to have a family. However, she added that she was not ready for it at the time and that she did not strive for at the time. It has been six years since the episode aired and things have changed a lot especially in her personal life. As we mentioned above, she is planning to get married to her beau, and during an interview with Vogue magazine, Rihanna shared that she is planning to freeze her eggs. She indeed hes babies on her mind as she even shared that she would not be able to take her eyes off her kids and her family would have to force her to hire a nanny. Just imagine the children born from the genes of her and her beau Jameel. That would be amazing. Watch Riri having a good time with children. So, OK guys, we might not get to see miniature versions of Riri any time soon but it is sure to happen, and we can not wait for the day. And also let’s not drag things because she is finally planning to settle down for the first time after Chris Brown and let’s cheer for her. Vera Jimenez lives a very low profile: Know about her career. Is she married? How good Matt Lanter is at doing makeup of his wife Angela Lanter revealed!! who is English Journalist Naga Munchetty Married To?